NFS has been the “go to” file system for large data stores but there is a new offering on the horizon...Object Storage. To help ease the transition, many Object Storage vendors have provided a gateway that allows their systems to look like NFS servers. The problem is that most of these implementations are very limiting and often create more problems than they fix. 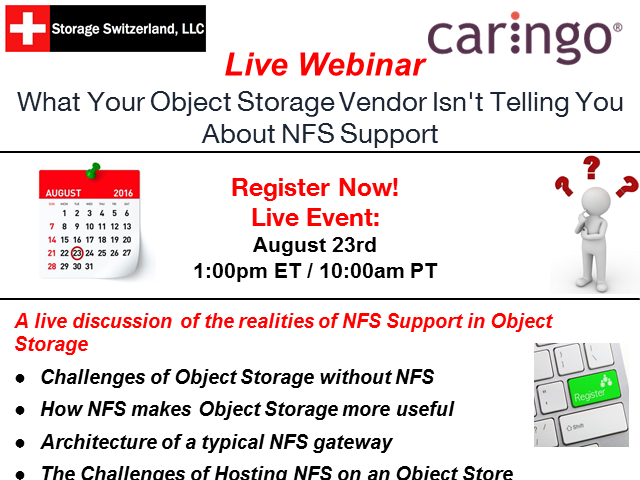 In this webinar Storage Switzerland and Caringo will discuss why object storage systems are the heir apparent to NFS servers and how to make that transition without the typical roadblocks that NFS gateways create. This webinar will focus on understanding your own value and how you can use that to become an influential person in your industry. Listed as one of the UK's Top Most Influential Women in Tech & an international multi-award winner for her services to Diversity & Inclusion in the Tech industry, Sheree (@nirushika) is a Consultant, Deloitte; Founder, I Am Lanka; Board-Appointed Global Ambassador, Women Who Code; Forbes, Contributor. Sheree is a global tech outreach leader and the aim of her career is ensuring people are aware of the fantastic opportunities the tech industry has to offer & make certain that people (regardless of gender, race, social stature) are able to benefit from these & reach their full career potential. The cloud is changing the way we work. Disruptive technologies and business models are creating new opportunities to engage with co-workers, companies, and customers. However, workers are using an average of four communications apps each day, checking these 10 times an hour—leading to 32 days of productivity wasted each year. Richard’s presentation will be followed by a brief demo of a business workflow using the RingCentral unified app. Join this interview with Kelly Harris and Jean Ginzburg to discuss how to use digital marketing and social media to attract and connect with prospects. Find out what businesses should be doing to find the right prospects online and strategies to convert users into paying customers. Jean Ginzburg is a #1 best-selling author, serial entrepreneur, digital marketing expert with more than 10 years of industry expertise helping companies scale revenue, optimize sales and marketing processes and improve productivity. Jean is the CEO and Founder of JeanGinzburg.com, a digital marketing education company and Ginball Digital Marketing, a digital marketing agency. Jean's clients range from brand name Fortune 500 companies to innovative start-ups. Additionally, Jean is a contributing writer for AMEX Open Forum, Influencive and Authority Magazine. In July 2018, Jean was named a "Women to Watch" by Colorado Biz Magazine. The price you pay for your UCC subscription, software, servers, or licenses is only part (and often, a small part) of your overall costs for UCC. And there are differences depending on your selected architecture and vendor. • What are the differences in operational costs, by size of rollout, for select providers? • How do those costs change if you decide on a cloud vs. on-premise rollout? • What are the top 5 questions I should ask in my UCC RFP? We also will demonstrate Nemertes’ UCC Cost Analysis Tool, an interactive tool that uses Nemertes’ research data to deliver actual costs customized to your organization. While many organizations record meetings and stream live town-hall broadcasts, the growing availability of video cameras in PCs, laptops, and mobile devices is enabling anyone to create and share their own video, either on-demand or live. But how do companies enable video broadcasting while ensuring compliance with governance and security controls, and the ability to meet video's performance needs? Despite widespread deployment of videoconferencing, organizations still struggle with achieving adoption, utilization, and positive impact on their organizations. In this webinar we'll share data from Nemertes 2018 Research Study: Visual Communications and Collaboration to provide you with insight you need to achieve videoconferencing success. Attendees will gain real-world insight from their peers to help them refine and develop their own strategies for leveraging videoconferencing to improve collaboration and communications. The world’s most valuable resource is no longer oil but data. IoT data will change so many industries and is waiting for someone to extract, analyze and exploit it. This presentation will examine the barriers that have prevented the connection of high volumes of low cost sensors and will highlight the key use cases for big data management and analytics across networks. Kevin has 25 years experience in the mobile telecom industry, having held a number of senior positions with Mobile Network Operators and infrastructure vendors. During the last 10 years his career has focused on enabling service providers, infrastructure vendors and mobile operators to grow their global M2M/IoT businesses by establishing relationships with external stakeholders in the value chain and creating opportunities for collaboration. At most organizations, conference rooms are less than perfect--and that affects the productivity of any meeting. Inconsistency is the cornerstone of meeting room space, whether it's the power outlet locations, wired or wireless connectivity, brand of digital whiteboard, or video conferencing capabilities. That's why many companies are investing in "Conference Room of the Future" initiatives. Nemertes recently conducted research among 600+ global organizations, and this webinar will focus on best practices. • What technologies are crucial to effective meetings? • Who should run the meeting-room overhauls for the most success --IT or facilities? • How do advanced technologies, such as artificial intelligence and Internet of Things, play a role in meeting rooms? • What should IT leaders look for in management and monitoring tools? We look forward to sharing this information with you and answering your questions! We'll look at specific examples of AI technologies in the context of communications and collaboration, and provide attendees with actionable guidance as they develop their own AI evaluation and implementation plans. Without a solid collaboration strategy, organizations are very unlikely to succeed at digital transformation initiatives, particularly those that involve improved customer experience. The "customer" may be internal or external to the company. This webinar reviews key data and real-world scenarios that show why collaboration tools enable customer experience improvements. • What measurable benefits do collaboration tools bring to CX? • How can IT and business teams use CX initiatives to help secure budget for collaboration projects? • What does management need to change--immediately--to help propel better collaboration and improved CX? • How do collaboration initiatives integrate with CX in the contact center? • How can you benefit from emerging AI integrations in both collaboration and contact-center tools? Team collaboration apps like Slack, Spark, Glip, and Microsoft Teams are taking the enterprise market by storm. Given the more than 20 apps now on the market, where do IT leaders begin? • What is the state of team collaboration adoption? • What are the drivers and business cases? • How do customers rate their vendors? • Will team collaboration replace or augment existing UC apps? • What are the pros and cons of a single vendor versus multi-vendor approach? • How do I integrate team collaboration into business apps and workflows? • How do I address security, governance, and compliance? • How are vendors differentiating themselves? • What are the on-premises alternatives if cloud is not an option? Attendees will gain the information they need to make better decisions as they build and deploy their own team collaboration strategy. Have you wondered which solution--on-premise, cloud, or hybrid—is the right Unified Communications architecture for your organization? Would you like to know which provider costs the most—and least? In this first episode of our five-part series on Unified Communications and Collaboration (UCC), Robin Gareiss, Nemertes President and Founder, will present findings from our real-world research on UCC costs—based on the cost data from our 2018-19 Unified Communications and Collaboration Research study. She also will introduce The Nemertes UC Cost Analysis Tool, our on-line, interactive, customizable tool that allows you to cost-compare solutions and providers. With this tool you’ll find out which architecture, and which provider, are the best fit for your organization. We look forward to sharing all this information with you and to answering as many of your questions as possible! Unified communications simplifies and integrates all forms of communications within the enterprise. By ‘unifying’ phone, e-mail, chat, voice mail, fax and other key processes related to internal and external communication, you can automate all forms of human and device communications into a common user experience. As a result, organizations will optimize business processes, enhance human communications, reduce latency and manage flows while eliminating device and media dependencies.